I read this book via Star Book Tours. 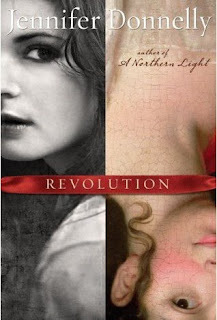 Jennifer Donnelly has been my favorite author ever since I read The Tea Rose and A Northern Light. When I pick up one of her books, I know I will become lost in the story. She is a phenomenal writer. It takes her a few words to do what it takes most authors several chapters to do (if they accomplish it at all): she can fully transport you into the world she has written. Every word she pens is so lyrical, emotional and descriptive: the mind boggles (well, mine does). He closes his eyes and his face, already beautiful, grows even more so. He smiles. Frowns. Nods. Gasps. He moves his graceful musician’s hands as if he’s conducting. After a few minutes, I see tears on his cheeks and I’m jealous of him. To hear that music for the first time – not in a movie or a car ad, broken up in bits and pieces, but complete like Ludwig wanted you to – it must be amazing. All that being said, this is my least favorite of the books she has written so far. I had a really hard time making myself care about Alex, the girl from the past. I skimmed some of her diary entries and tried not to feel too guilty about it. By the end, when the two worlds began to merge, I understood why we had to spend so much time with her. But, I’m still a little iffy about that part of the story. Andi was a very captivating character. I did become invested in her story. She was a very tortured and dark teenage girl, lots of baggage and issues. Her family was torn apart by tragedy, and she ended up with no one to lean on. Her parents were both pretty worthless. When she was forced to go to Paris with her father, she never imagined how much her life would change! I love Love LOVE the way her story progressed. She definitely makes the book. So, even though I won’t be remembering this book quite as fondly as some of Donnelly’s previous books, it is still pretty excellent. I definitely recommend reading it, even if you just pick it up from the library once it is released! I'm sad to hear it's your least favorite of her books. I'm still really looking forward to this and can't wait until it finally comes out. A Northern Light is my third favourite book ever. I can't wait to read this one. It's too bad this one disappointed you! Previous post: Got Books? Giveaway Winners!